The idea of supreme God in Hinduism pervades all teachings and methods of worship although it may not always be visible. It is also the main feature of Shaivism and Vaishnavism. Both the sects believe in one God who assumes different forms and roles for the sake of creation. Hinduism is unique because it is essentially a monotheistic faith which acknowledges polytheism as reflective of the diversity in God's creation. God is one, but also many. He manifests Himself in innumerable forms and shapes. As Purusha (Universal Male), He enters Prakriti (Nature, Matter or Divine Energy) and brings forth the numerous worlds and beings into existence. He upholds His entire creation with His unlimited powers. He is both the Known and the Unknown, the Being as well as the Non-Being, Reality as well as Unreality. As the Unknown, He is rarely known and worshipped in his unmanifested aspect (avyakta) for difficult and painful is the path for those who choose to worship Him as the Unmanifested (The Bhagavad-Gita XII.6). He exists in all and all beings exist in him. There is nothing other than Him, and there is nothing that is outside of Him. He is Imperishable, unknowable, immortal, infinite, without a beginning and without an end. However, when worshipped with intense devotion and unshakeable faith, He responds to the calls of His devotees and comes to their aid and rescue. All the gods and goddess are His manifestations only. 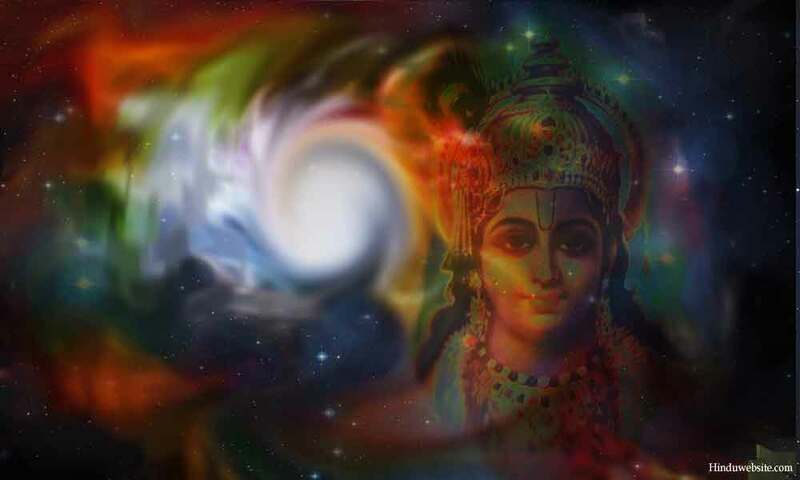 In His female aspect He is Shakti, who as the Divine Universal Mother assists the whole creation to go through the process of evolution in Her own mysterious ways, acting as the field and force of creation. The relationship between God and His devotees is purely personal. They have the freedom and the permission to approach Him and worship him in their own ways. The world may create divisions and categorize people into groups (Jati) and castes (Kula), but for God they are all the same. There are no fixed rules and no central controlling authority on the subject of devotion and what should or should not be done. They are influenced mostly by a person's karma and his or her family traditions. The scriptures and law books (Smritis) do provide guidelines and suggest methods of worship but whether to follow them or not is purely an individual choice. The concept of monotheism is not new to Hinduism. It is as old as the Vedas themselves. References to One indivisible and mysterious God are found in the Rigveda itself. The concept is the central theme of all the Upanishads in which He is variously referred to as Brahman, Iswara, Hiranyagarbha, Asat, etc. While the students of Upanishads tried to know Him by the path of knowledge with utmost secrecy and there by made it the exclusive domain of a few enlightened persons, the bhakti marg or the path of devotion brought Him closer to the masses and contributed to mass awakening. The One Imperishable and Ancient Being was no more a God of remote heights, secret teachings and elite classes, but a popular and personal God of infinite power, love and compassion, eager to help His aspiring devotees in numerous forms and willing to perform miracles if necessary. The rise of tantric cults added a new dimension to our understanding of Him. To the tantric worshippers, the Supreme Self is the Universal Mother (Shakti). Purusha is subordinate to Her, who plays a rather passive and secondary role in Her creation as the witness. For them Shakti is not a dependent entity, but independent and supreme. Being passive, God cannot initiate creation unless He is joined by Shakti. At the highest level and in his purest aspect, He is satchitananda. Truth, Consciousness and Bliss. As the lord of the universe, He is the inhabitant of the whole world and the indweller of all. There is nothing that is outside of Him or without Him. He exists in the beings (jivas) as Atman, the Enjoyer who delights in Himself, without undergoing any change, but willing to participate in the cycle of births and deaths and bear witness to the illusions of life. He is realized in many ways. The paths or the methods that lead to liberation or union with God can broadly be groupd into four, the path of action, the path of knowledge, the path of renuciation and the path of devotion. All the paths are interrelated, and for success on any path, perfection in others is necessary. The first path requires performance of selfless actions, the second one pursuit of self-knowledge, the third one renunciation of desires and worldly life, and the fourth one devotion to God and absorbing the mind in the contemplation of God. Of the four, the path of devotion is considered the best. In the Bhagavad-Gita we come across an integrated approach. The path of action incorporates the essential elements of the other three as one integrated approach to liberation in which a devotee has to live a divine centered life as a servant of God upon earth (bhagavata), performing his actions with detachment, without any desire for the fruit of actions and offering them to God with pure devotion and total surrender. Thus, it can be seen that Hindus have a broader approach to the concept of God and his worship. One may call Him by any name or worship Him in any form. The names and forms of God are mere reference points to know him and relate to him in the objective world. Since the senses can only grasp the objects, for us God becomes an object, while the reality is that He is transcendental, beyond the senses and hidden in the objects. Otherwise, how can we worship Him, who is unreachable, indescribable, beyond grasp, and beyond all words and thoughts? He objectifies the best and the highest in us. He elevates our very thought and vision, and represents the loftiest ideals, which we can aspire to achieve in our search for meaning and truths about ourselves. He is the highest goal (Parandhama), attaining which in our individual ways is the very purpose of our lives. Those who quarrel about His name or forms, blinded by their faith and their attachment to it, are ignorant and deluded. They never attain him, until they mend their ways. Truly, the Brahman of Hinduism represents the Highest principle which the human mind can ever conceive of. He is not God of just one world or a few worlds, but represents the entire known and unknown Universe as well as Time or Kala, the all devouring God of Death.